This 7 week positive, progressive class is for ALL DOGS over the age of 5 months. Whether you have never trained your dog or have just let things slide and need to regain some control…BASIC MANNERS FOR EVERYDAY LIFE is for you. We will be teaching behaviors like coming when called, staying when told, walking nicely on a loose leash and learning how to control and communicate with your dog through basic obedience commands such as sit, down, and wait using lots of praise, treats and play to help your dog learn the exercises. Problems and concerns of the group will be discussed. The first class is a chat class – people only. Do not bring your dog to the first class. Classes are offered on Mondays and Saturdays. 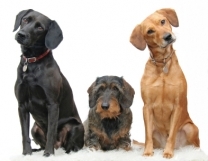 Visit our Pet Obedience Class Calendar for start dates and session status.